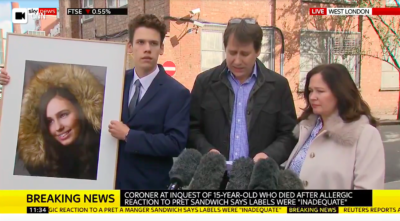 A second young girl died from an allergic reaction to an ingredient in a sandwich bought from Pret A Manger, the firm has confirmed. The girl died after eating a “super-veg rainbow flatbread” that was supposed to be dairy-free. Pret A Manger said it had been missold a guaranteed dairy-free yoghurt that was found to contain dairy protein. The chain is already facing scrutiny over the death of 15-year-old Natasha Ednan-Laperouse, who was allergic to sesame and died after eating one of its baguettes. The second customer collapsed and died on 27 December last year after buying the sandwich in a store in the U.K.
Vegan brand CoYo, a coconut milk brand, recalled its yoghurts in February after dairy traces were found. CoYo denies the responsibility and blame. In February this year, Coyo recalled all of its dairy-free coconut yoghurts after they were found to contain dairy. The vegan brand was investigated by the Food Standards Agency and the London Borough of Bexley – where CoYo is based – before it issued an allergy alert. But in a statement on Sunday, CoYo denied it was to blame for the death. CoYo said the contamination of its yoghurts in February was not related to the Pret case, and urged against speculation. “The claims made by Pret are unfounded,” it said. Further more CoYo claims: “The dairy-free product we provided to Pret in December 2017, at the time of this tragedy, is not linked to the product we recalled in February 2018. The product recalled in 2018 was made with a contaminated raw material that was only supplied to us in January 2018. We think this will take while before solves. It’s very tragic, because everybody loses. Our thought and prayers go out to the families of both young girls.